Organize video conferences and meetings with your suppliers and partners, work remotely or simply backup your data to the cloud. Our phone solution has been designed with your needs in mind! 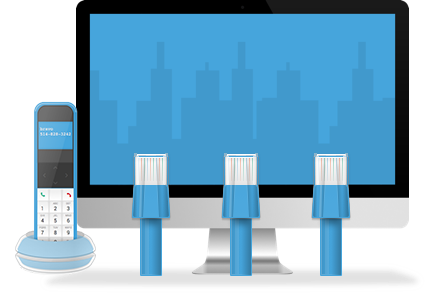 Expand your business network through our competitive business IP telephony offer. Enjoy unlimited local and long distance calls to Canada/USA adding a little extra to your monthly payment. Internet fiber to your neighborhood, then a powerful cable network from the neighborhood central to your business. For the following speeds ( 5M & 10M – 60M & 120M) :The first monthly service fees will be withdrawn on the day of your installation. For the following speeds (15M to 30M) : Installation fees and modem rental are free. Your monthly payment will be debited from the day of activation of your service.